Merry Do Beauty Products has been introducing high-level techniques to the hairdressing and beauty industries since 1965. We developed esthetic products for hair with the application of mud for the first time in Japan and have been supplying the market under the name of Hair Esthe<1>. <1> Hair Esthete and SCALP ESTHETE are the registered trademarks of Merry Do Beauty Products Co., Ltd.
As an established innovator in the field of product development, we would like to introduce NBOS (Natural Brand Owner System). 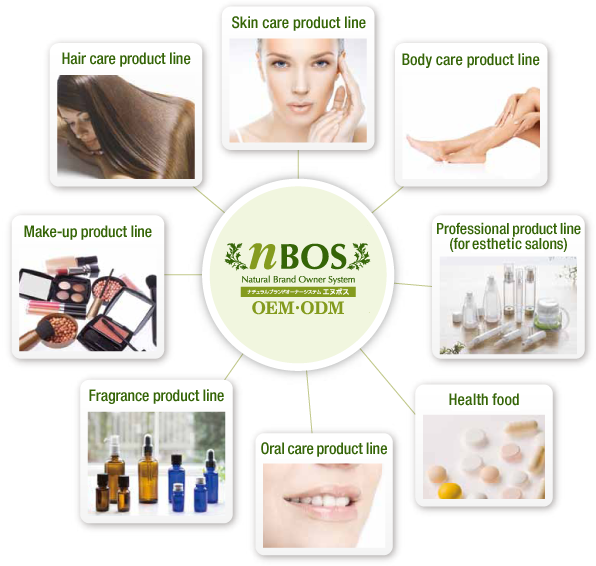 We provide NBOS products using safe ingredients for a growing number of clients who prefer organic products made under manufacturing processes based on companies’ and salons’ images and wishes. We develop, manufacture and support a variety of beauty products. We produce products in addition to the ones below.